The construction industry in India is an important indicator of growth and development as it creates investment opportunities and increases production capacity across various related sectors. With a share of around 8.2 per cent, the construction industry has contributed an estimated 670,778 crore (at current prices) to national GDP at factor cost in 2011-12. While its growth rate in 2010-11 was 8.0 per cent, in 2011-12 it decelerated to 4.8 per cent due to both external and domestic factors. The sector is labour intensive and, includingindirect jobs, provides employment to around 33 million people. 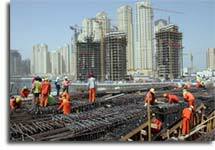 It is estimated that about 70 per cent of these are employed in the infrastructure segment and the remaining 30 per cent in the real estate segment.According to industry estimates, the industry is expected to generate additional employment of 47 million, with the total number of persons employed in the sector reaching 83 million persons by 2022. The sector is critical for enhancing the productive capacity of the overall economy . Since the sector was given industry status in 2000, there have been more initiatives by the government to undertake projects on PPP basis. These initiatives have resulted in more private ownership of build-operate-transfer (BOT), build-operate-own-transfer (BOOT), and build-operate-lease-transfer (BOLT) projects. FDI up to 100 percent under the automatic route is allowed in townships, housing, built-up infrastructure, and construction of development projects .